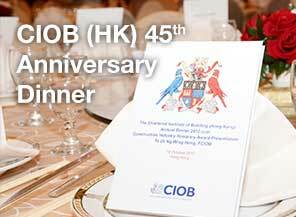 The Chartered Institute of Building (Hong Kong) (“CIOB (HK)”) will host a half day Conference on 21 September 2018 with the theme “Smart Construction • Collaborate Excellence” at the New World Millennium Hong Kong Hotel. The smart construction will drive a step change in how we build and how our built environment operates. In the near future, the construction industry should be “smart” meaning it is an industry that is cost efficient, innovative and technologically advanced, with smarter design, requiring shorter production time, less materials, reducing carbon as well as less labour for construction.